Soap sprays are some of the oldest insecticides used by gardeners in the old days; gardeners used to boil water with Fels Naptha soap to create an effective soap insecticide. Over time, these "old fashioned" remedies fell out of favor as they were replaced by much stronger and more toxic chemicals. 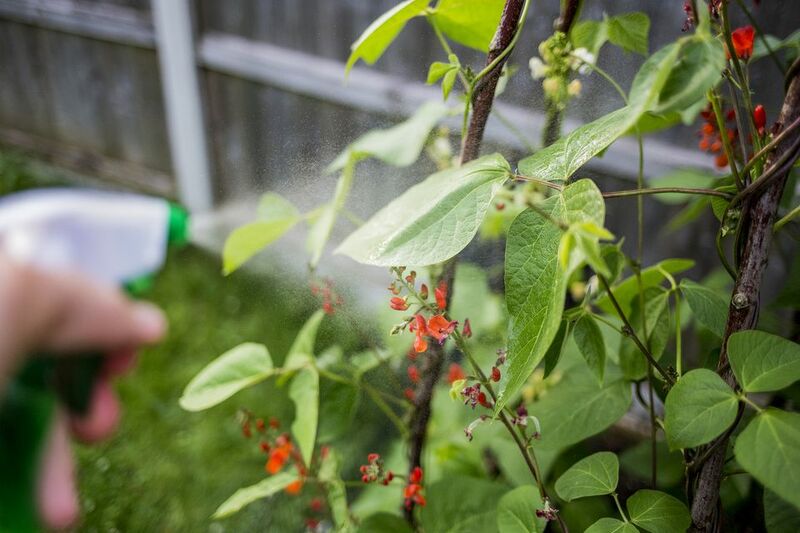 Today, however, as the interest in organic and less chemical-intensive gardening continues to grow, insecticidal soap sprays have made a major comeback. You can find these products in virtually every garden center or, if you find the right ingredients, you can make your own. Insecticidal soap works through several mechanisms. The soap itself penetrates insects' cuticles, which causes cell collapse and desiccation. In other words, it dries them out. They also operate by suffocating insects such as scale insects. In general, soap sprays are effective for soft-bodied insects including mealybugs and aphids. To varying degrees, soap sprays are also effective against chiggers, earwigs, fleas, mites, scales, and thrips. They are not effective, however, on chewing insects such as caterpillars and beetles. Although soap sprays are less toxic to gardeners and non-pest animals, they can still be potentially damaging to some plants, especially if an oil has been added to the spray. Before the widespread use of any spray, test it on a small section of the plant first and wait at least 24 hours to see if there are any negative effects. Look for signs like spotting, wrinkling, and browning on leaves. If you see any negative signs, discontinue use of the product. Plants that are susceptible to damage from soap sprays include beans, cucumbers, ferns, gardenias, and peas. Soap sprays can be purchased or made at home. Be careful, however, because there is a difference between detergents and soaps. Clear dishwashing detergents are not the same as soaps and should not be used in soap sprays. Instead, look for brands like Ivory Snow, Ivory Liquid, Dr. Bronner's, or Shaklee's Basic H. Do not use any product with additives like fragrance. To make your soap spray, start with the weakest solution possible, mixing between 1 teaspoon and 3 or 4 tablespoons of soap per gallon of water and using it immediately. When you spray, soak both the tops and bottom of leaves and directly spray any visible insects. The spray needs to make direct contact with the pest insect to be effective. There is some debate about whether or not you should use oil to enhance the effectiveness of your spray. Technically, oil is not necessary for the soap to work. However, adding oil will enhance the effectiveness of your spray and increase its shelf-life. To make an easy at-home spray base, Rodale's recommends mixing 1 tablespoon of soap with 1 cup of cooking oil and emulsifying by shaking vigorously. When it comes time to spray, mix 1 to 2.5 teaspoons of this base to every 1 cup of water and spray immediately. Soap sprays can also be enhanced with additives to control fungus and chewing insects. You can safely add bacullus thuringiensis (BT), copper fungicide, or pyrethrin to the mix, depending on your needs. If you prefer to buy an insecticidal soap, there are some effective commercial products on the market labeled insecticidal soap, many including supplemental ingredients. As with home-made spray, test this on a few leaves before applying to the whole plant.